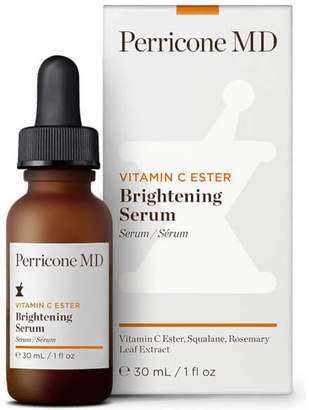 Restore natural radiance with Perricone MD Vitamin C Ester Brightening Serum , a powerful, multi-tasking face serum fortified with Vitamin C Ester; a more potent, less irritating form of Vitamin C. Promoting a brighter, more even toned complexion, the lightweight Vitamin C serum delivers smoothing and illuminating properties, targeting uneven tone and discolouration to inspire a healthy-looking, balanced complexion. Also contains Rosemary Leaf extract to hydrate and firm the appearance of skin while visibly reducing the look of fine lines. Citrus fragrance. Free from parabens. Not tested on animals.